Sometimes I get annoyed with my self-imposed one-act-a-week deadline. It often causes me to rush too quickly through groups that have multiple albums worth spending a lot of time on. However, there are also some benefits to doing things this way, and one of them is that I get a very good sense about how a band evolved over time. As I cruise through the week going back and forth between early and late material, the contrasts and changes are always fun to consider. 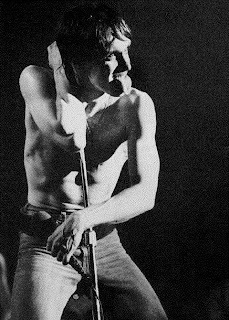 Such was the case this week; I selected Iggy Pop, but decided to cram his work with the Stooges into this post as well. Perhaps this is squeezing too much interesting music into a short amount of time, but it also highlighted the sheer difference between the Stooges' material and Pop's solo work, produced with David Bowie in Berlin. The Stooges revel in their rebellion, committing themselves to a project of "Search and Destroy." Their music is raw, wild, a whirlwind set to annihilate everything in sight. Pop's solo work on Lust for Life and The Idiot, made after a spiral into terrible drug dependency, contains little of the youthful iconoclasm that marked the Stooges' work. The music sounds like the work of a man who is a little older, a little wiser, a little more appreciative of life. It's not that the music is necessarily restrained, but there's no longer a sense that Pop is engaging in physical and musical self-mutilation. The decadence has become refined, leisurely, a bit more grown-up. Lyrically, perhaps there's not that great of a difference between Pop's "Search and Destroy" mission in 1973, and his "Lust for Life" four years later. But musically, the two songs are worlds apart, the first willfully destructive while the second sounds almost life-affirming. Yet both songs clearly came from the same artist - it's not as if Iggy Pop lost something in those four years of drug-addled depression. But something has changed, the music has shifted, and it's a very interesting thing to see the reflections of the old Iggy Pop in his newer music. WHAT I KNEW BEFORE: Bizarrely enough, Iggy Pop had a recurring role on the old show Pete and Pete as the father of Little Pete's best friend, so I knew him from this. Musically, however, I was only familiar with "Lust for Life" and "The Passenger," thanks to their frequent use in television commercials. MY LISTENING: I listened to Lust for Life (1977) every day this week. I also listened to The Idiot (1977) three times, and The Stooges (1969), Fun House (1970) and Raw Power (1971) twice each. WHAT I LIKED: Lust for Life certainly has its high points, including the raucous beat of the title track (one of those things you can't help but drum along to), and the ominous "Neighborhood Threat." But the best Iggy Pop album to come out in 1977 is the more synth-oriented, Bowie-influenced The Idiot. At the same time and in the same country that Kraftwerk was manufacturing pristine, almost sterile electronic music, Pop uses the machines here to reflect the grungy drunken gutters of Berlin. The electronic glissandi that begin "Nightclubbing" are perfect for the song, and the roaring synths on "Funtime" reflect the seedy subject matter somehow far more adequately than the more straight rock on Lust for Life. Pop's work with the Stooges is nothing less than good, old-fashioned rock and roll, and part of me wonders if I should have devoted an entire week just to this band alone. The Stooges has some great hits, and "I Wanna Be Your Dog" is the best rock song I've heard to ever feature the sleigh bells. But, for my money, the best twenty minutes of the Stooges you can get comes on the second side of Fun House, when a saxophone joins the outfit and all hell breaks loose. "1970" gives away to the even crazier "Fun House," before everything falls to pieces in "L.A. Blues, "which reaches an unprecedented level of sonic chaos. This run of three songs demonstrates the Stooges' deceptively strong song-writing as well as their ability to blow your ears off with pure noise. These are not two traits that should go well together, but somehow they do. WHAT I DIDN'T LIKE: I've always loved "The Passenger," which I consider not just Iggy's best song, but one of the best songs to come out of the seventies. So when the rest of Lust for Life failed to reach the heights of that track (or the immensely enjoyable "Lust for Life"), I must admit that I was kind of disappointed. It's a solid album, but having already experienced its best tracks, I found myself more drawn to The Idiot this week. Strangely enough, "Success" was the only single released from Lust for Life, and I find it one of the least impressive songs on the album. As for Raw Power, it has some enjoyable tracks, but it almost feels like the band placing style over substance and trying too hard for the album to live up to its title. Still, even though it sounds like it was recorded in a tin can with the volume pushed to eleven, there's no song on this album as annoying as "We Will Fall," a ten-minute exercise in nothingness from the Stooges' first album. For the record, this might be the only straight-up boring song the Stooges ever did. FURTHER EXPLORATION WOULD ENTAIL: Iggy Pop kept popping out albums long after anyone was paying attention to him - New Values (1979) seems to be the most highly regarded, and a few times in the 80s David Bowie would show up and give Pop a fame-boost. The Stooges also released a fourth album, The Weirdness, in 2007. Yes, as in the past decade. Do I need to listen to any of these? Probably not. BEST SONG YOU'VE HEARD: "The Passenger"
BEST SONG YOU HAVEN'T HEARD: "1970"
The first time I heard this song, I was not expecting a saxophone to come in at the end. That just made it cooler.